In this animated spinoff of the animated series Total Drama, some of the original series' characters find themselves in an alternate universe in which they are toddlers instead of teenagers. Other than that, though, life is a lot like it was on the original series. Toys Will Be Toys: Courtney becomes a toy tester but forgets that the most important thing is to have fun. From Badge to Worse: In order to earn her final Girl Campers badge Courtney must earn Gwen's friendship. A Licking Time Bomb: Owen and Noah unwittingly become cookie moguls and must hide the secret ingredient, which is Owen's spit from licking the sprinkles off the cookies. Having the Timeout of Our Lives: Owen forms a special bond with Duncan after having loads of fun with him during their timeouts. Courtney refuses to share her valuable collectors’ item toy with her classmates. Duncan, Leshawna and Jude all want corner pieces of Izzy's Birthday Cake- But are they prepared to go to any length to get one? When Owen hides a walker-talkie inside his chili dog, Harold believes it’s an alien here to destroy Earth. After befriending a chicken with a bad attitude at a petting zoo, Jude is followed back to school by the chicken; he defends the bad bird’s behavior until he can defend it no longer. Total Dramarama is currently available to watch free on Cartoon Network and stream on Cartoon Network. 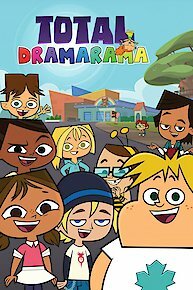 You can also stream, download, buy, rent Total Dramarama on demand at DIRECTV NOW online.